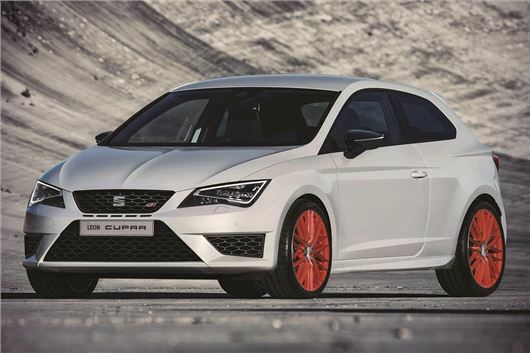 SEAT has announced the ‘Ultimate Sub8 performance pack’ for the 280PS Leon Cupra. The pack costs £4200, bringing the price up to £31,140, and adds various performance accessories, as used in the Leon Cupra that managed a sub eight minute lap of the infamous Nurburgring. Cars fitted with the pack get 30mm larger brakes with Brembo calipers, stickier Michelin Sport Cup 2 tyres, body-coloured side skirts and unique orange alloy wheels. Weight has been saved, with a simpler air conditioning system and fewer speakers for the audio system. SEAT Has cut the kilos in other areas too – the centre armrest and rear air vents, for example, have been removed. Buyers can choose a manual transmission or a DSG twin-clutch automatic, but there are no other options. The latest fast Leon faces stiff competition, with plenty of new hot hatches emerging in recent months. At the lower end of the spectrum is the latest Corsa VXR, while for slightly more money buyers can get a stripped out Megane Trophy or the latest Civic Type R.
The Leon Cupra 280 with Ultimate Sub8 performance pack is available now and all will be built to order.